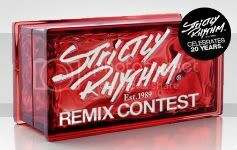 Another remix contest by Beatport, this time collaborating with the mythic house label Stricly Rhythm. The track to remix is Armand Van Helden’s “Witch Doktor”. Good luck! from the best of the underground and mainstream producers around the globe. To end 2009, we are proud to partner with Strictly Rhythm to celebrate the labels 20th anniversary and offer aspiring producers the chance to remix Armand Van Helden’s House classic ‘Witch Doktor’. On December 15th, 2009, Beatport will make available for download the stems of ‘Witch Doktor’, Armand Van Heldens 90’s house classic. Armand Van Helden has inspired producers and introduced waves of sounds over his long career. Join us in celebrating his career and the 20th anniversary of Strictly Rhythm.